Custom Helpwr Heddiw Badges designed for one of our customers in Wales. 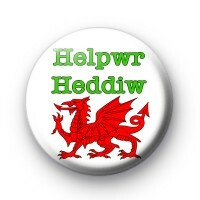 The badge reads Helpwr Heddiw which means Today's Helper in welsh. Standard 25mm button badge hand made in our UK workshop.